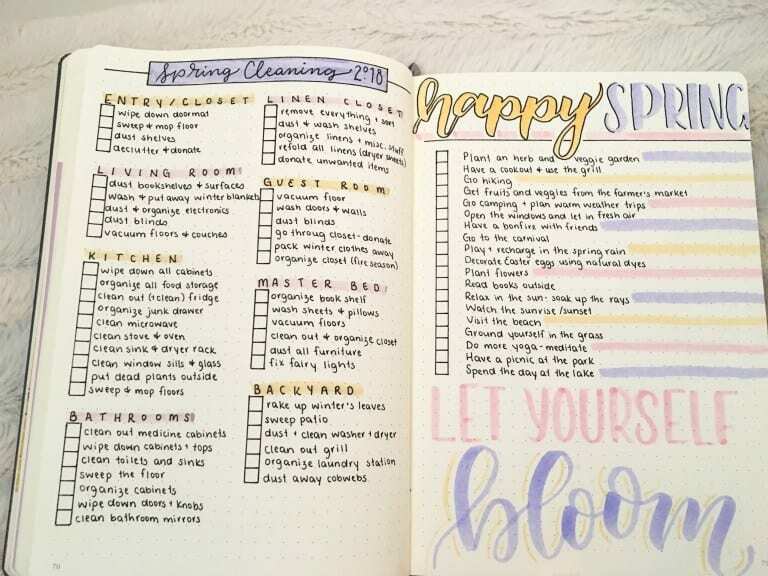 If you are like me and struggles to include cleaning in your endless list of chores, a bullet journal can help you. 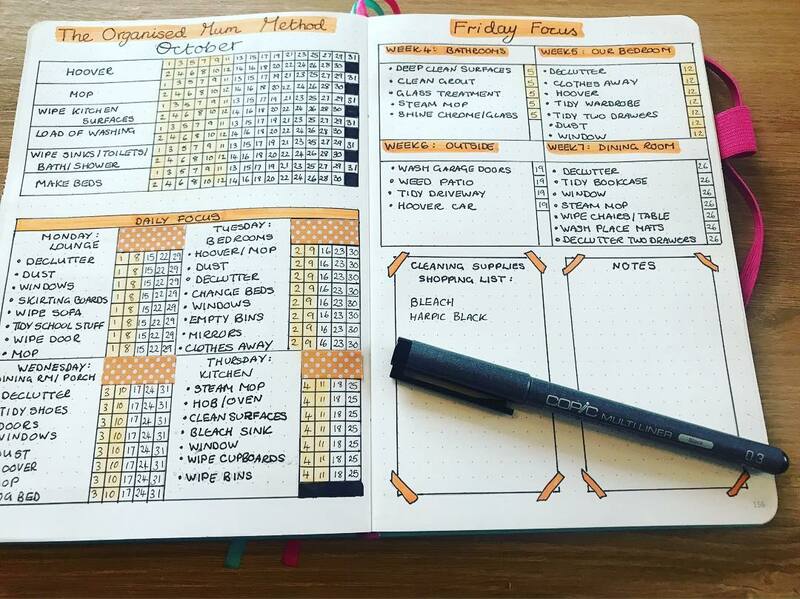 Yes, a bullet journal can rescue you in cleaning and organization too. There are so many decluttering and tidying up that needs to be done in a home to make it liveable for you and your family. And if you are not organised and consistent with it, it will show up in no time. Nobody wants to live in a place where you have to plod through a mountain of clutter to reach the next room. Am I exaggerating a bit? Makes me think of one of Ross’ girlfriends in FRIENDS, ew! 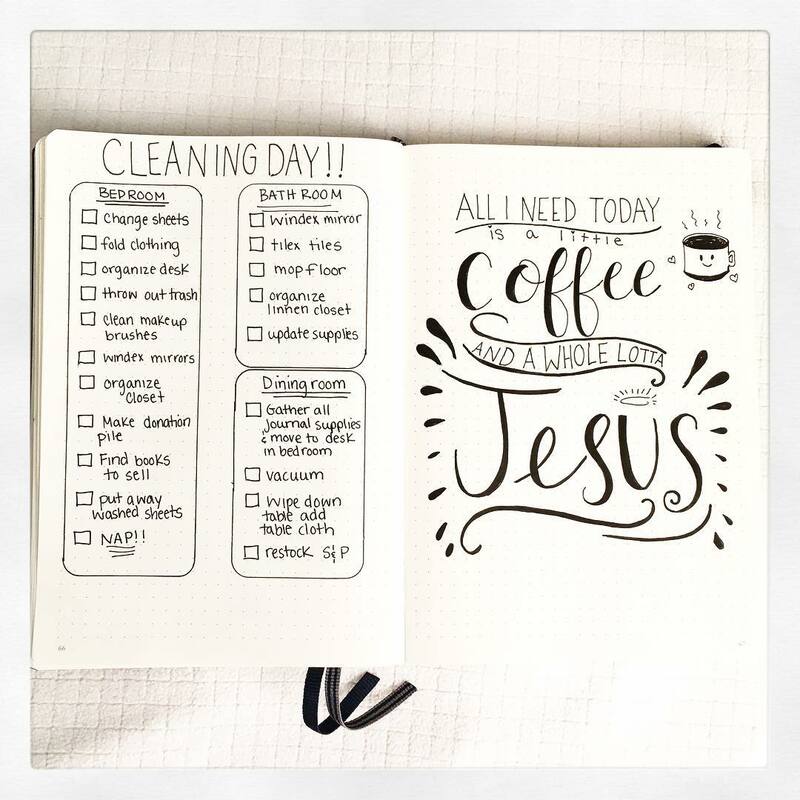 Well, this post has 22 bullet journal spreads on cleaning. 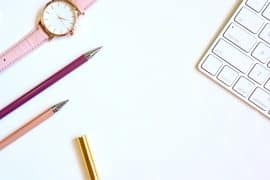 There are different systems that teach you to clean your home effectively like the KonMari method, the Flylady method, The Organised Mum Method etc. And there is seasonal cleaning which happens in spring. I have collected trackers for all these systems and some general spreads. So please make sure you scroll to the end to find the ones that fit your needs. Now that spring is around the corner, everyone would love to get out of the winter blues and welcome the fresh warm air. And thus begins spring cleaning, to freshen up our homes and minds. 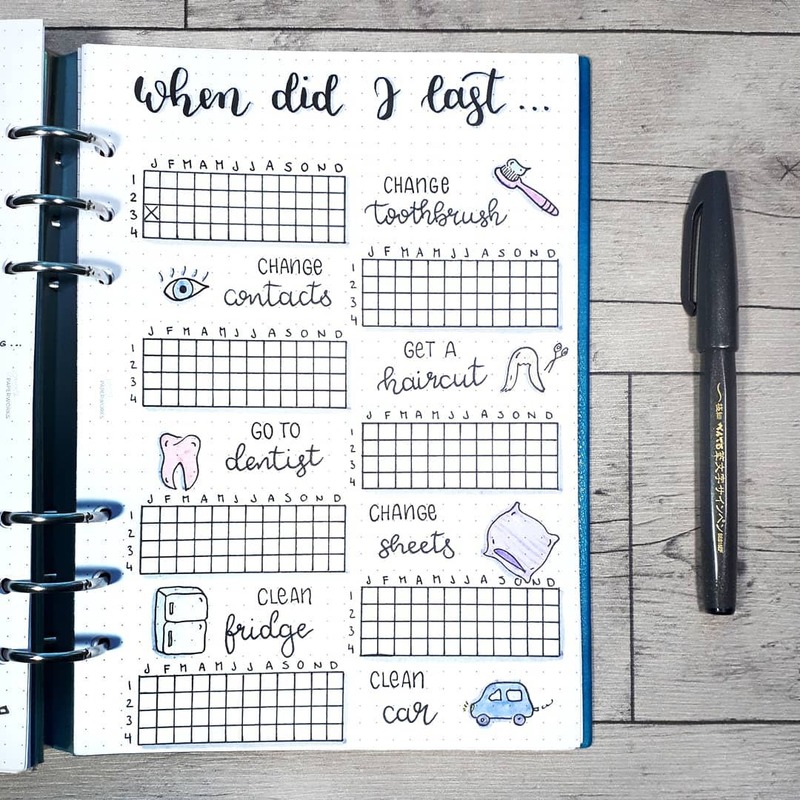 This spread from littlebearcreations.com is a pretty and functional spread that has a checklist that is very useful. She has listed out all the rooms that need deep cleaning and everything that is to be done in each room. Since it also has a checklist, you can check off each item as you go along. The second page of the spread has a list of activities that she hopes to do in the spring. This spread is from Megan of pageflutter.com. 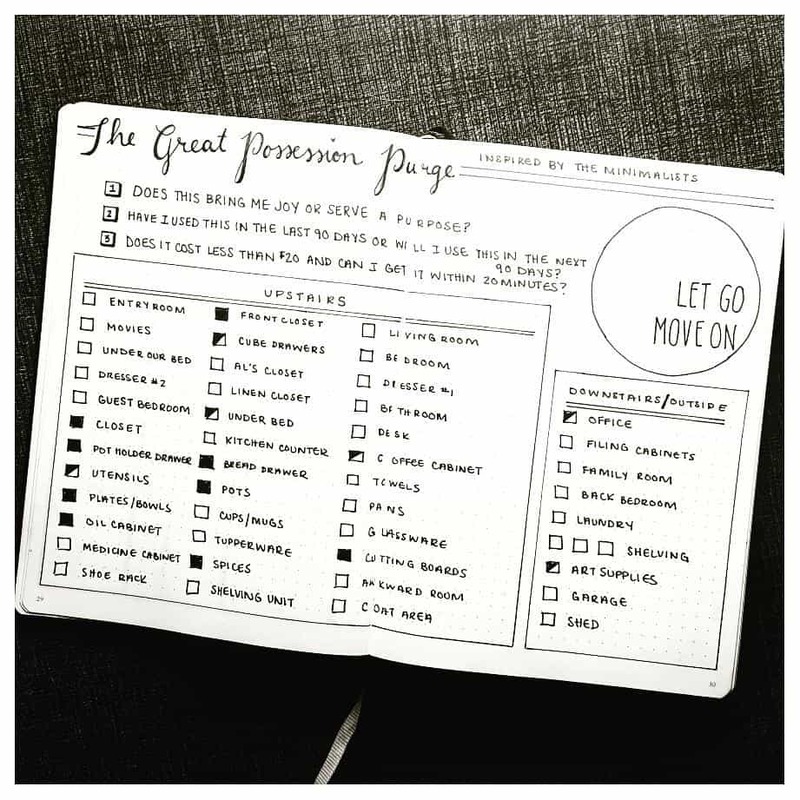 Her blog is one of my favorite resources for bullet journal inspiration. And this post on cleaning is not different. She created this spread based on the famous KonMari method. 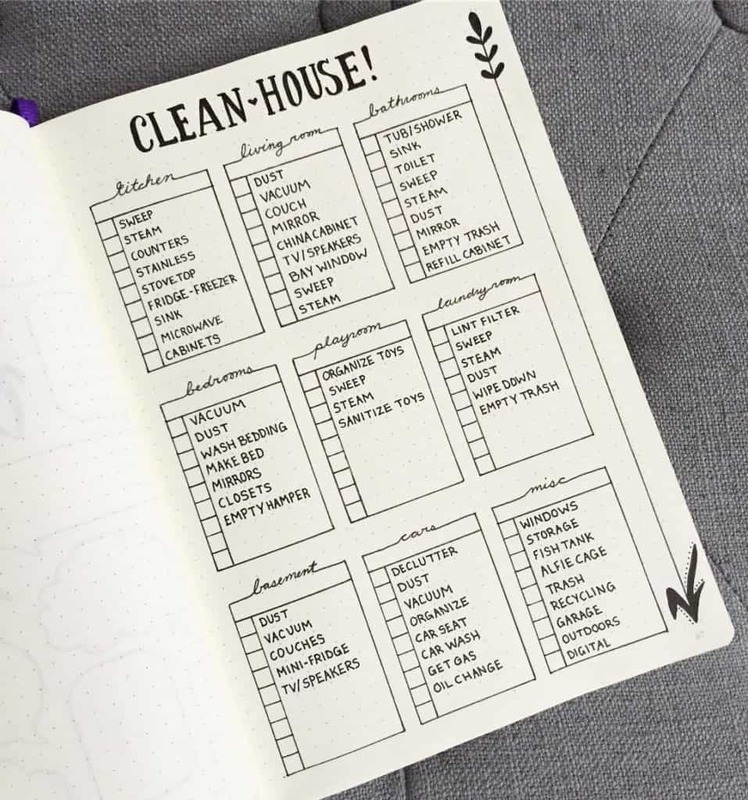 The first page of the spread is a chart which has all the rooms listed on the x-axis and all the chores listed on the y-axis. Each room has been assigned a color too. The second part of the spread has a more detailed list of tasks that need to be done in each room. These spreads are useful for anyone who wants to declutter and deep clean their house at any time of the year, not only in spring. 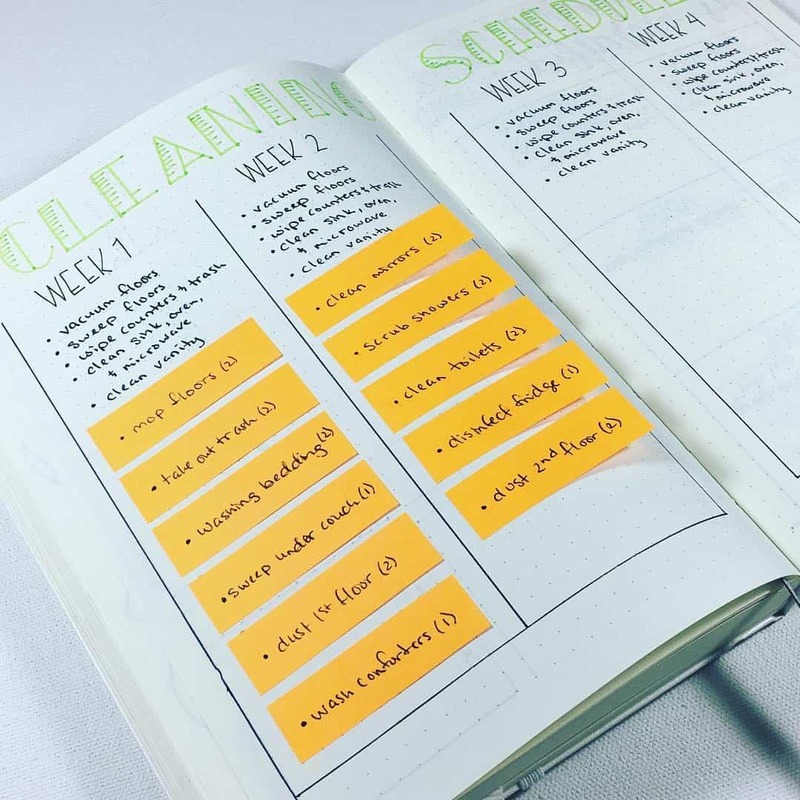 This spread from @everythingisnerdiful has cleaning tasks of the whole month listed and spread into four weeks. The repetitive tasks that need to be done every week are written on top. Other non-repetitive tasks are written on sticky notes which is a clever idea. 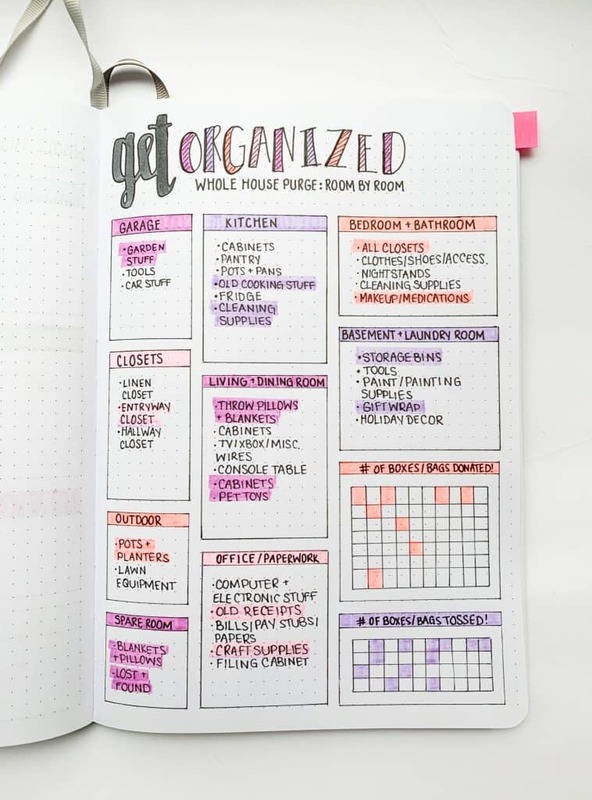 You can remove the sticky notes and add new ones every month so that this spread can be used again and again until your notebook lasts. 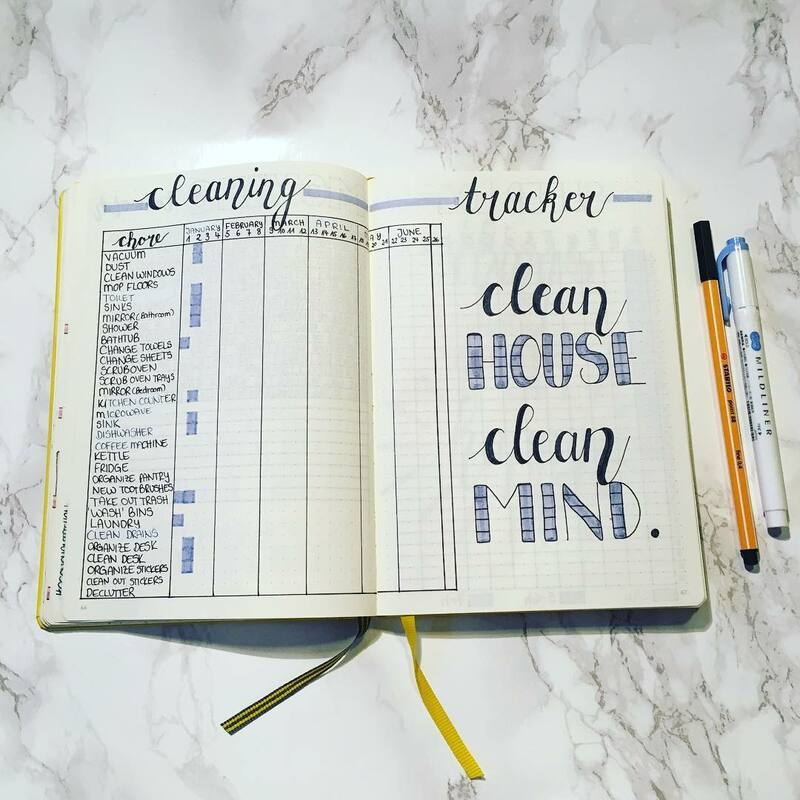 I love love this annual cleaning schedule tracker from @my_blue_sky_design. I love how functional it is. When you have such a spread made in your bullet journal, you can just relax and focus on the other important things in life. You see, I often feel it’s not the big tasks but the small ones that nag and eat your head from focusing on important work. Such as cleaning tasks which never ends. You have to do them as long as you live. Hence, it is very useful to create such spreads that can take out the overwhelm and keep you right on track. What I love about this spread is, it is color-coded for each month. So whenever she finishes a task every week or biweekly in January she marks it in the corresponding boxes in blue color. And in red for February and so on. 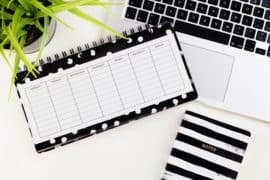 And she has also scheduled the tasks that need to be done bi-annually for each month and has also noted which month it should be repeated again. A brilliant spread! This cleaning schedule from @janwithaplan53 is the same as above, but the only difference is, stickers are used instead of drawing. You can make use of stickers in your bullet journal if you don’t want to draw. 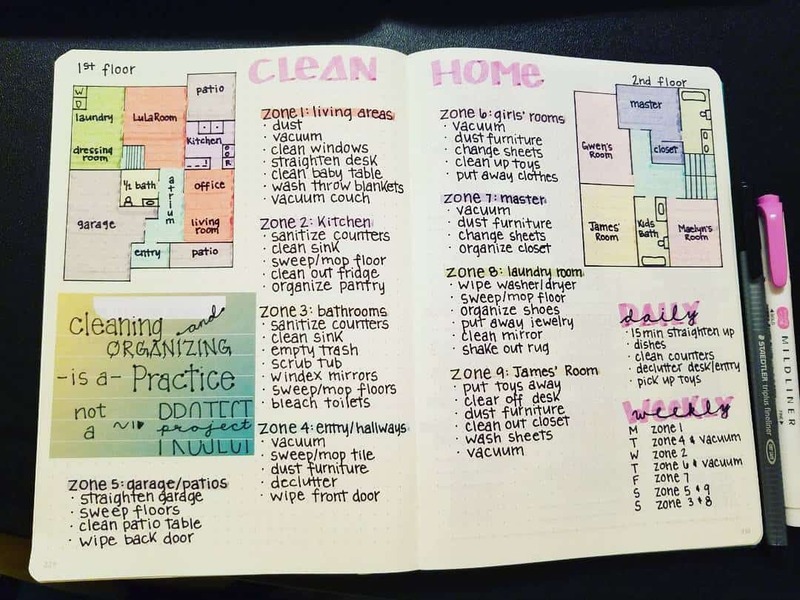 This spread by Erin from sidereallife.com helps to plan the decluttering of the whole house. The items to go through in each room is listed so that you have a clear idea about the items to be thrown out or donated. This spread from @emschwartzrdn is useful for decluttering your house. She has made a checklist for each area of the house as well as for other items like utensils, towels etc. If you don’t want to go through the decluttering at once, you can look at the spread and focus on checking off the item in the list one by one. 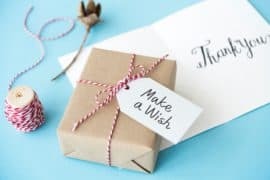 And also she has three questions to be asked while deciding to declutter each item which helps in deciding what to keep and what to toss away. Such an assessment is necessary because decluttering is truly an emotional experience and a difficult task! The KonMari Method of cleaning is taking the world by storm these days. The KonMari method introduced by Marie Kondo is a method of decluttering and organizing. According to the system, we are encouraged to clean by categories and not by rooms. That is, gather all belongings that belong to a category (for eg: books) and discard the items that you do not need anymore. The important question to ask when discarding is “Does it spark joy?”. If your mind says no, discard it. After getting rid of the items you don’t want, you are left with the items that truly bring joy. Now you start tidying up by putting everything in its place. She recommends a particular order for decluttering. That is, to go from categories that are easier to discard-to the harder ones which have sentimental value attached to them. 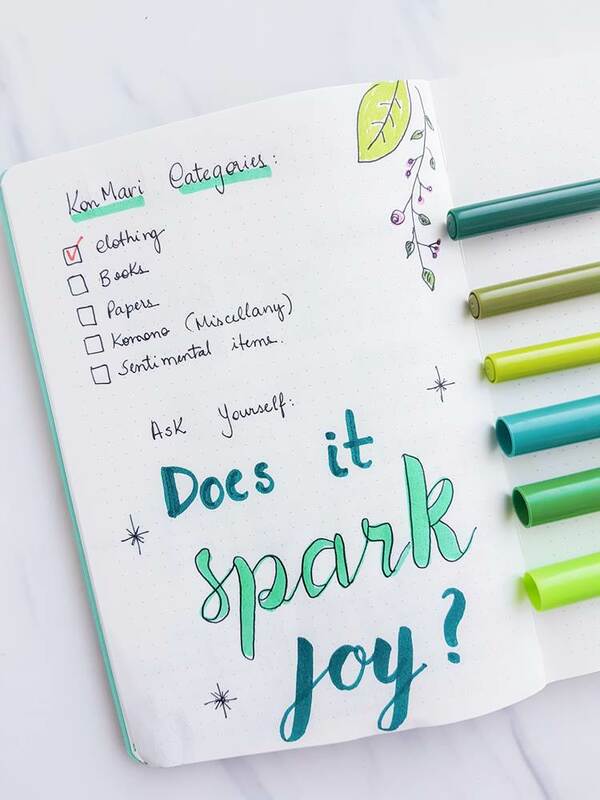 Here is a bullet journal spread from diaryofajournalplanner.com that shows the categories in order. 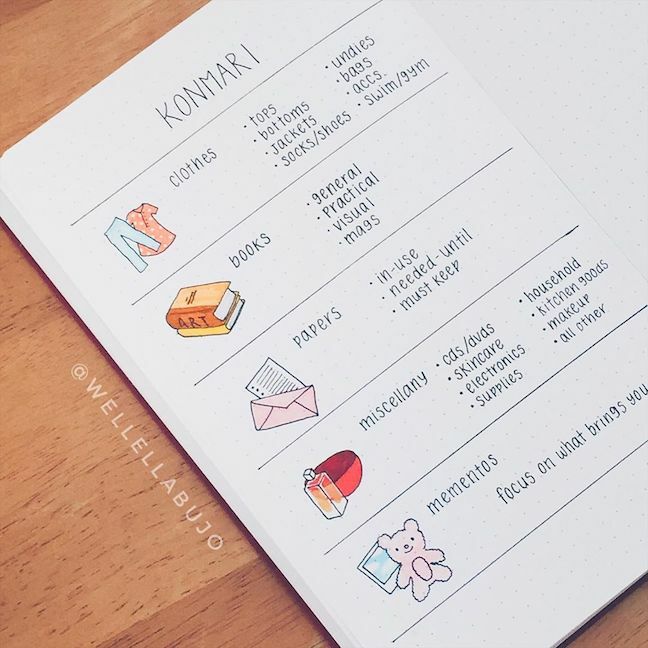 Another spread from @wellellabujo that is a checklist of items to declutter in each category. One more KonMari spread which is from @thejournalishome. She has made a huge checklist of items that need decluttering so as not to leave anything off. 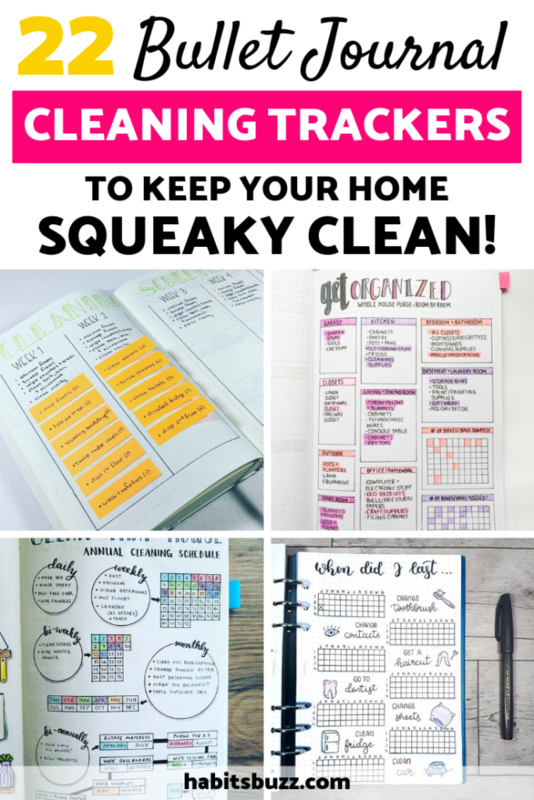 This is a cleaning tracker from @journalsbyemily. 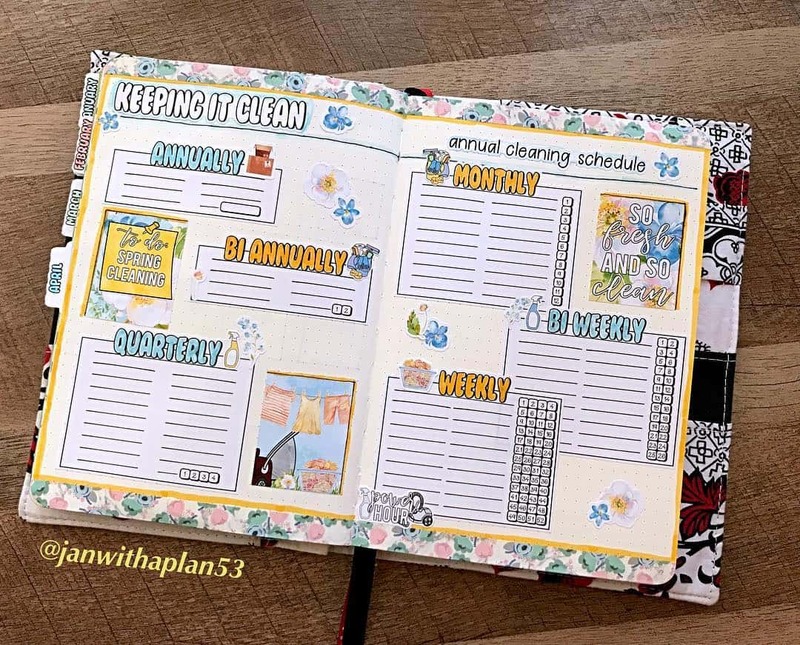 She has made use of tables to create a cleaning calendar for the whole year in her bullet journal. The weekly calendar may look repetitive, but it gets you things done and be consistent with the cleaning chores. The same can be said about the monthly cleaning schedule. You know how weeks and months pass quickly, that often you forget it’s time to do the monthly blanket wash or some other monthly cleaning task. So, such spreads help to keep you in the loop. I love circular trackers! In addition to adding variety to your spreads, they are also visually appealing. 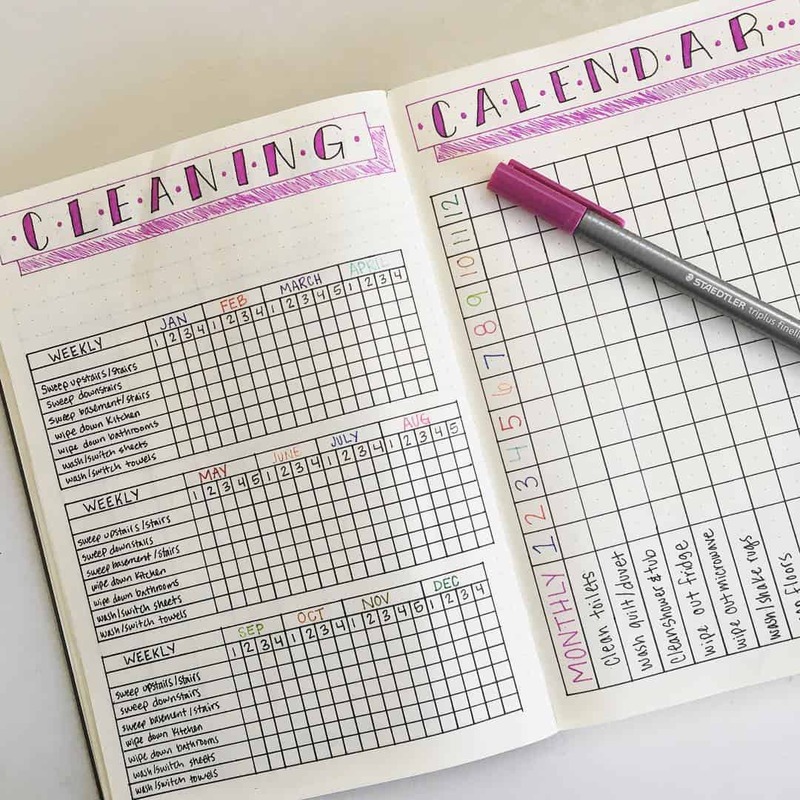 See how @happie_jenn has created this cleaning spread which can be used to track all the weekly, biweekly, monthly and annual chores in one tracker. It’s beautiful! If any of you follow FlyLady’s zone cleaning method, here is a tracker for you. According to Flylady’s cleaning system, your home is divided into different zones and you are supposed to clean every day on these zones for only 15 minutes a day. 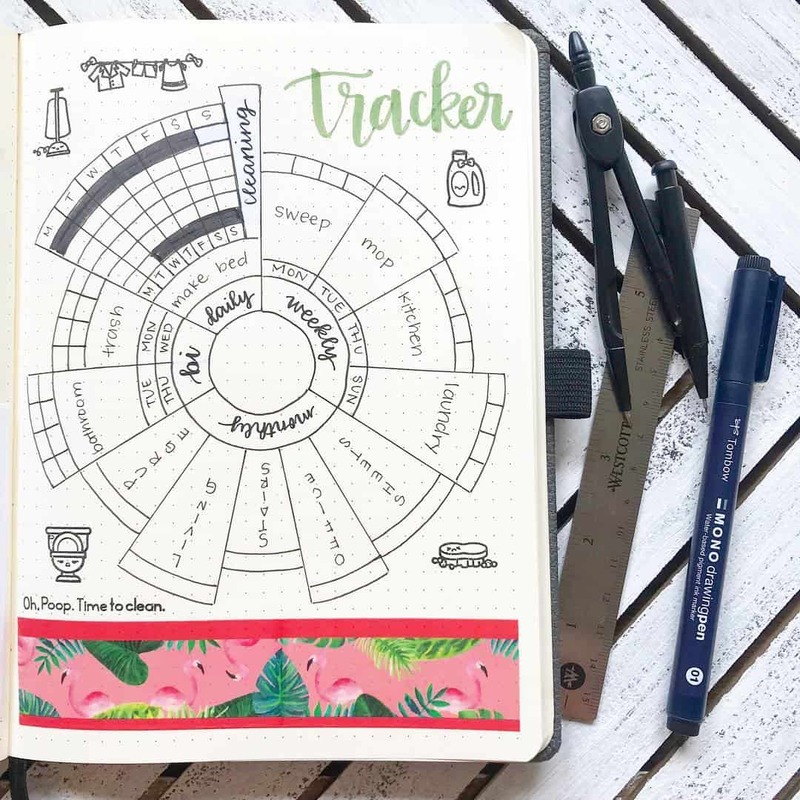 This tracker from @bujo_boss has all the zones and cleaning tasks for each zone listed. She has also allocated the cleaning of each zone to each day of the week. If you are more comfortable with cleaning one room fully before moving onto the next, this spread from @plansthatblossom can be useful. 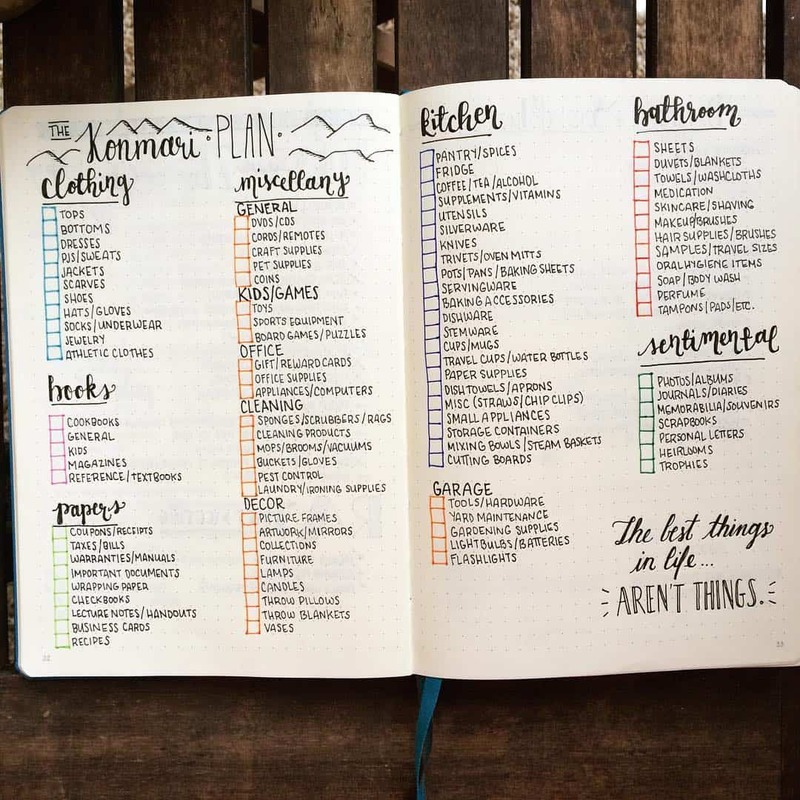 It is a minimalistic spread with a checklist. If you use a pencil to check off the items, you can reuse the spread as many times as you want. 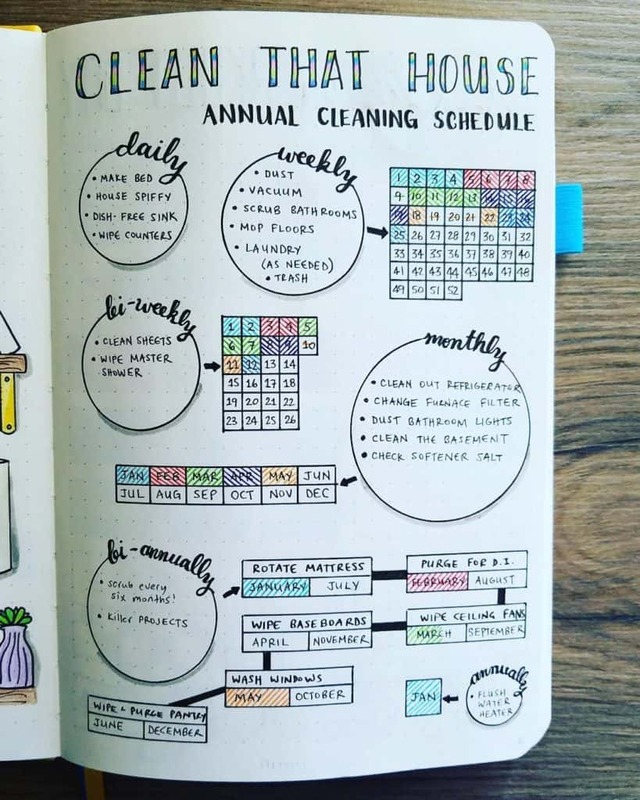 This spread from @sandia.bujo is a tracker for monthly cleaning. You can make this spread along with the other spreads for the month. 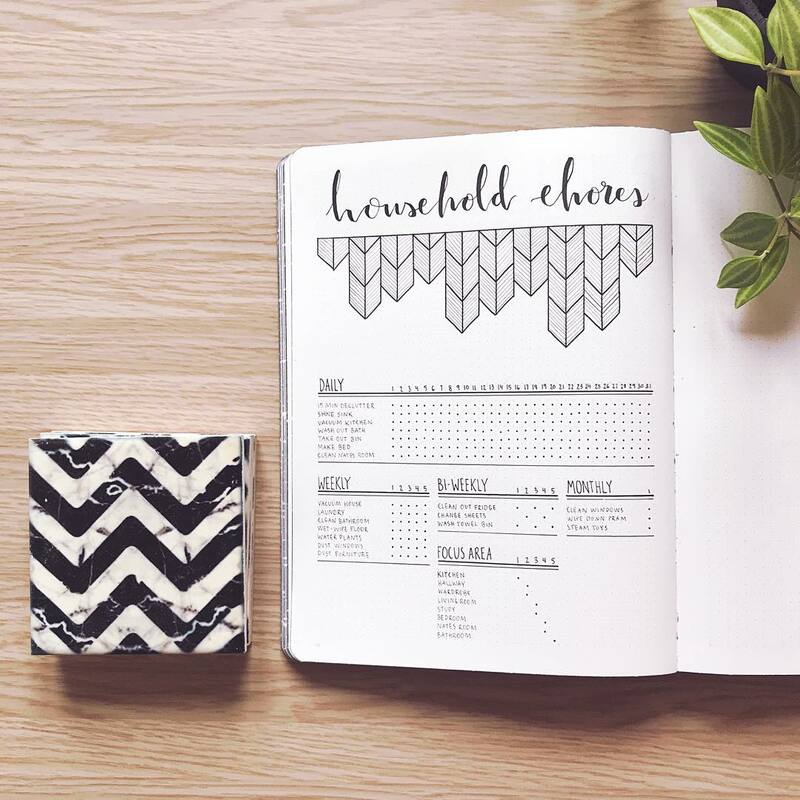 Here is a black and white minimalist spread from @abulletandsomelines to track your monthly cleaning spreads. I don’t usually draw doodles in every spread, but I doodle sometimes to practice mindfulness or when I am in a mood to draw. I found some beautiful doodle patterns in @abulletandsomelines, do check it out. This is a lovely spread by Deena of @craftydeesigns. She has dedicated each day of the week for each room or by chore. This is suitable for people like me who like to finish one task before going to the next. And also I like how she has written the names of the rooms in the background. Lovely! 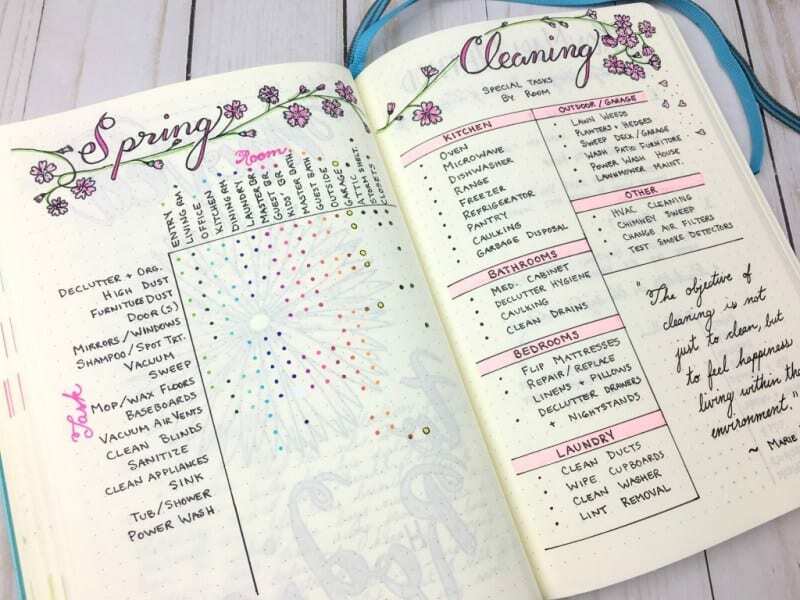 Look at how Emma of @busy_mum_with_a_bujo has created this pretty as well as functional cleaning spread in her bullet journal. Day-specific tasks that take 30 minutes: Each day of the week is assigned specific jobs /rooms. Friday Focus: Friday is for areas in your home that don’t require frequent cleaning, with an 8-week cycle. To know in detail about the TOMM, read this post. So often we underestimate how much work can be done in 15 minutes. Not only in cleaning, be it any task. 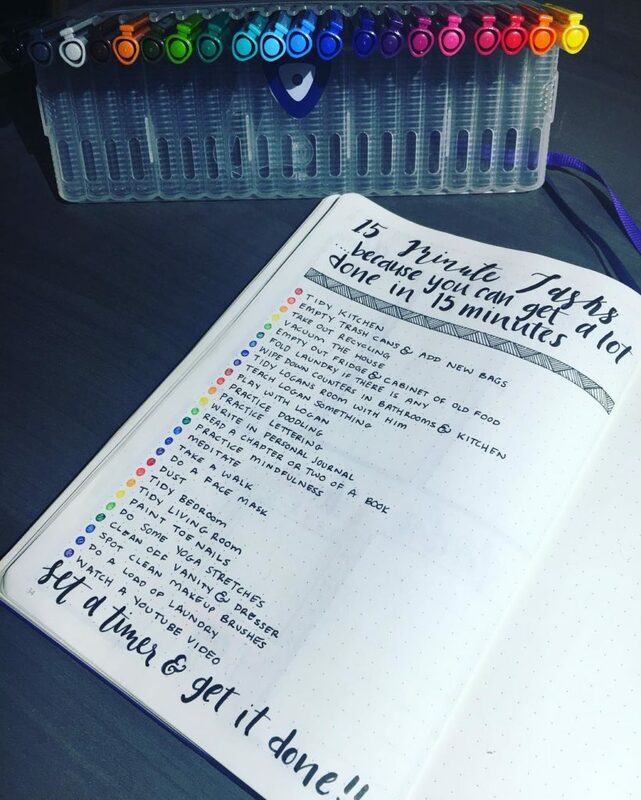 If you make a readymade list like this in your bullet journal, you can make sure you don’t waste any free time you have. Just choose a random task from your list and get it done! Spread by @miahopart. This spread is from @sonjacharlotteplans. 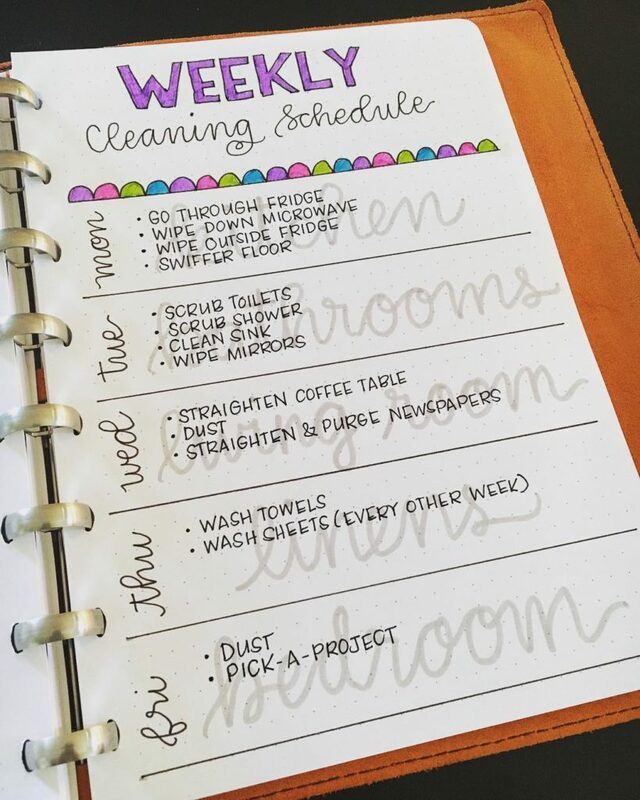 This layout can track the weekly chores of six months. If you are a regular bullet journal user, a notebook can last for about six months. So it makes sense to create such a spread. Also, it gives a visual idea of how much you did in six months. Creating a cleaning spread like this can be handy when you are on a cleaning spree. 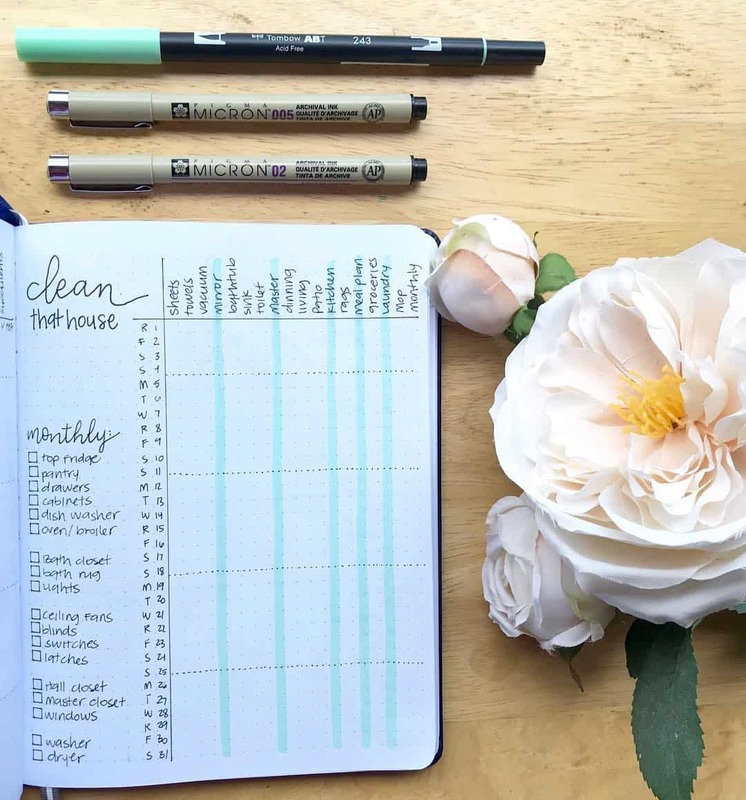 This checklist spread from @littlebluelife17 can be used when you decide cleaning is your priority for the day. Here is a ‘when did I last’ spread from @seras.bullet.journal with cute doodles. This is particularly useful for people who are forgetful like me. I often forget when I last changed my toothbrush, Ouch! 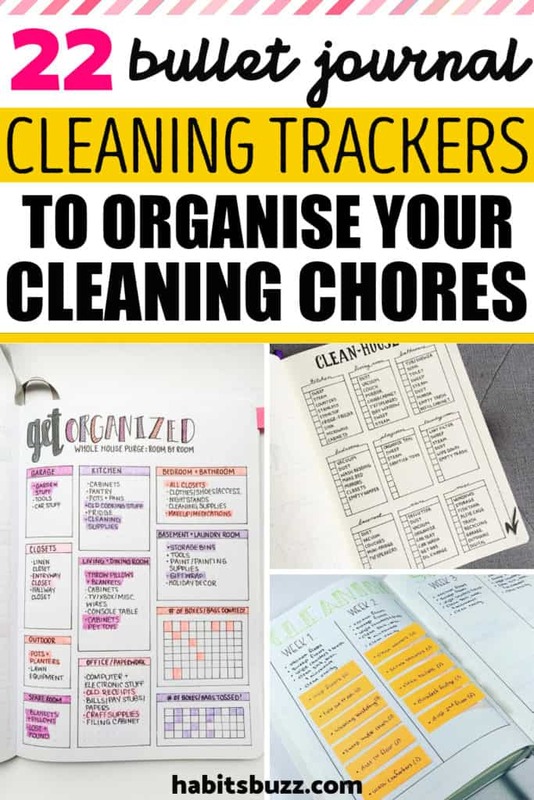 So we reach the end of this roundup post and I hope you have got enough inspiration to organize your cleaning chores with the help of a bullet journal. Pin this post so that you can come back to it whenever you need inspiration!